Supports key immunological functions and circulation around joints and tendons to ensure normal mobility and flexibility. Assists with optimal nerve tissue communication and the normal circulation of key enzymes that nourish joint tissue and facilitate immune activity. Relieves joint and bone pains associated with various orthopedic ailments. Helps to improve blood circulation which soothes pain. Muscle relaxant action helps to restore mobility. In its gel form, Rumalaya ensures better absorption and deeper penetration through the skin, and therefore, relieves pain more quickly. 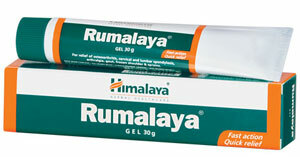 Apply a small quantity of Rumalaya gel on the tender area, followed by a gentle massage. Simultaneous use of Rumalaya forte tablets ensures complete relief faster.